You’ll hear adages stating that Daiwa Proteus rods focus on the SoCal offshore fishing market. In fact, these rods deserve a thorough inspection by any offshore angler looking for a new stick. The immediate attention grabber comes in the form of price, not to mention design and performance. Strong graphite rod blanks with superior components lift the Proteus series above many an angler’s expectations. The Daiwa Proteus Graphite Composite Offshore Rod. Product: Daiwa Proteus series offshore casting and spinning rods. Overall Ranking: 87 out of 100. As a top manufacturer of offshore reels, Daiwa can’t help but put their technology towards making rods. 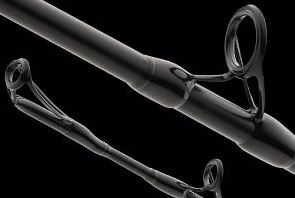 Proteus rods make a fine example of the wonders Daiwa scientists do with graphite material. The rods are powerful yet light, and they use top of the line Fuji components. Anglers have a choice between 3 spinning and 10 Proteus casting rod models. Rods range from 7 to 9 feet in length and all have fast action. Most of the bend will be in the tip before the rod solidifies. Daiwa Proteus rods offer a range in power and line ratings for different styles of offshore fishing. Like most rods, the model numbers tell a lot about its specs. The PRT at the beginning designates the rods as Proteus models. I’m guessing the B means the rods rate for braided line, though they fish with mono as well. The following number represents the length of each rod. 80 is an eight-foot rod while 76 is 7 foot six inches. The final letters show the power and action of each rod. Notice they all end in F for fast action. The powers vary for the angler’s choice. You won’t have as many choices with only 3 spinning reel models but it’s better than nothing. 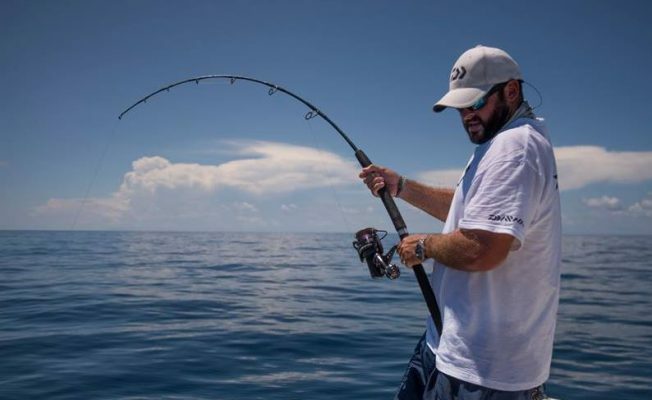 Spinning models offer 1 rod that’s 7’6″ in length and the other 2 are both 8 foot. Remember these are fast action rods. The shorter rod has heavy power as does one of the 8-foot models. The other 8-foot model has medium power. These are all 1 piece rods and rate for braided line at 55-80 pounds on the heavy power models. The medium power rod rates for 30-55 pound braid. 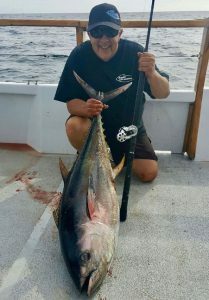 Angler With A Nice Tuna On A Daiwa Proteus Rod. 10 models of casting rods bring a better variety of choice to anglers. The shortest rod starts the line at 7′ and sits alone at that length. It’s an extra heavy power rod with only 9 guides instead of the 10-12 in the longer models. This rod rates for 30-60 mono or 70-120 braid which is the highest rating any of the models have. As for the longer models, Daiwa makes four offerings of both the 7’6″ and 8-foot rods. Both sets of lengths cover the power spectrum, with rod strengths of medium, medium heavy, heavy, and extra-heavy. They provide line ratings anywhere from 10 up to 60-pound mono or 20 to 120-pound braid. The 7’6″ rods have 10 line guides while the 8′ rods come with 11. Note that the extra-heavy 7’6″ rod adds a guide for stability, putting it at 11. The final rod also stands alone at 9 feet in length. It’s a heavy power rod that rates for 30-50 pound mono or 55-100 braid. The longest of the Daiwa Proteus rods comes set with 12 Fuji line guides. Again, all Daiwa Proteus rods are 1 piece and have fast action. 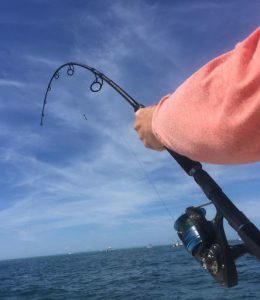 Nothing shows what a rod can do better than actually using it, but the features give you a decent idea. These typically show off the rod blank material, type of guides, reel seats, and handle style. It’s within these ingredients that rods will pack their features. So what does graphite composite mean? It’s a pretty general term and one that doesn’t really describe the strength of the rod. 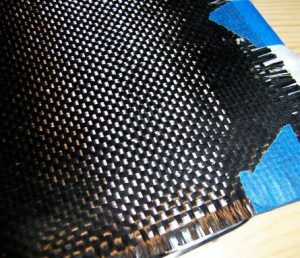 Graphite is carbon fiber and sheets of this material layer to make the rod blank. Daiwa then infuses the layers of graphite with resin. Composite just means that the blank uses more than one material. When they add the resin (and anything else) to the graphite it has more than one material, which makes it a composite. This doesn’t tell you the modulus of the graphite, but it is lightweight by nature. Suffice it to say that Daiwa Proteus rods are very strong. When a company fails to name the maker of the components, it’s a bad sign. You’ll see stainless steel or aluminum oxide guides instead of a brand name like Fuji. 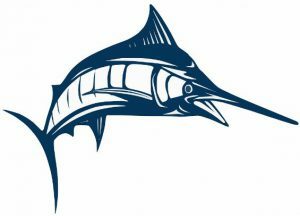 There are other makers of quality components, but Fuji is a dependable company that anglers have come to trust over the years. Fuji DPS reels seats are hard plastic with cushions to protect the blank. They have a sturdy lock nut and stainless steel hoods. 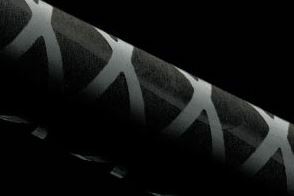 Daiwa turns to Fuji for the line guides on the Proteus rods, and they go with one special design at that. First off, the guides are Alconite making them strong as can be and virtually impervious to rust. Second, the feature of this choice in Fuji guide is its tangle free design. This is particularly handy when fishing with braid, which can tend to tangle and form knots around the guides. One nice feature of Proteus rods is the length of both the top and bottom of the split style handles. There’s enough room up top to find a comfortable place for your hand, and the length below provides powerful leverage. 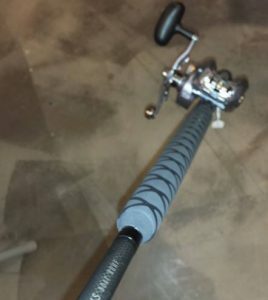 Tube grip is a common choice for offshore rods and the x pattern across the handle provides a little extra hold. The x pattern weaves its way, covering both top and bottom of the split handle. It raises up slightly above the tube grip, giving your hand anchor spots on the handle. What stands out most in a rod of this caliber with high-quality Fuji components is the price. Sure, you can pay more for a Seeker or CalStar rod, but Daiwa Proteus rods will get the job done just fine. They make an excellent choice for those who might want some cash left over for the reel. The only action available on Daiwa Proteus rods is fast, which may be a drawback for some. The offerings of length aren’t bad until you need a jig stick, The only real option is the 9-foot heavy power rod. Graphite brings up concerns of its own as a material for fishing rod blanks. It provides a lot more backbone to the rod, but it sacrifices the durability of fiberglass. The fact that Proteus rods are composite means the graphite mixes with other products to make it stronger. Still, many anglers prefer T-glass over graphite. It’s well worth taking a look at Phenix Black Diamond or Axis rods for your jigging needs. What Kind Of Angler Do Proteus Rods Fit Best? Proteus rods can do damage to strong fish. They’ll handle average size tuna dorado, and yellowtail no problem. They also cast well due to their strong backbone and fast action, a bonus for any boat rod. Live bait, surface casting, or vertical jigging with the shorter models are good uses for Daiwa Proteus rods. Proteus rods come with a limited lifetime warranty. If a rod inspection shows a manufacturing defect, Daiwa replaces it for the cost of shipping. Daiwa has service centers all over the U.S. and the world for that matter. If there’s ever a need for service, they typically don’t have to travel far. Overall Ranking: 87 out of 100 anglers approve of Daiwa Proteus rods. Saltwater fishing is a serious business. It’s worth spending money on premium gear to ensure the best performance on trips. There is a line where you can skimp a bit, and still get quality gear. 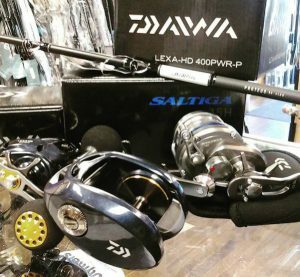 Matching the Daiwa Proteus rod with their Sealine reel is a perfect pair for starting saltwater anglers. No worries using it as a backup or just a cheaper option. What are your thoughts about Daiwa Proteus rods? Speak up and use that comment box. Readers want to hear your experience! Geoff@FishtFight.com. Hi geoff some good reviews there, and I believe you have made up my mind in buying a daiwa through your site, cheers for that mate and keep up the good work. Stu.B. Hey thanks Stuart. I have had a couple people purchase the Proteus rod by Daiwa. They make solid equipment. The feedback on Proteus rods has been overwhelmingly positive, though I have heard a couple grumbles of discontent. I think it’s got great value for the asking price. Geoff.